I've grown and been very successful in the past growing many different herbs such as rosemary, sage, basil, marjoram, and mint. But for some reason, I was never really able to harvest much of parsley and cilantro. As I'm trying this again would appreciate any input you guys have for being successful enough to harvest quite a bit of those as I love salsa's and using parsley in all sorts of cooking. I live in New Orleans (Zone 9). I grow them in containers filled with Miracle Gro Potting Soil which I add Compost to. I'm starting with transplants this year as I'm trying to get back into the joys of gardening. I've always started with only one or two transplants each. They seem to grow rapidly and die off before I've gotten much of a harvest. Should I be planting more? Do they need more or less sun than the other herbs I've been successful at? I think that both parsley and cilantro are biennials. So lots of times if the transplant has been exposed to cold weather or low winter light conditions, whichever is the trigger, it thinks that it is two years old when rapid growth starts in spring/early summer. So that could be one issue, as the plant starts putting most of its energy into flower and seed production. 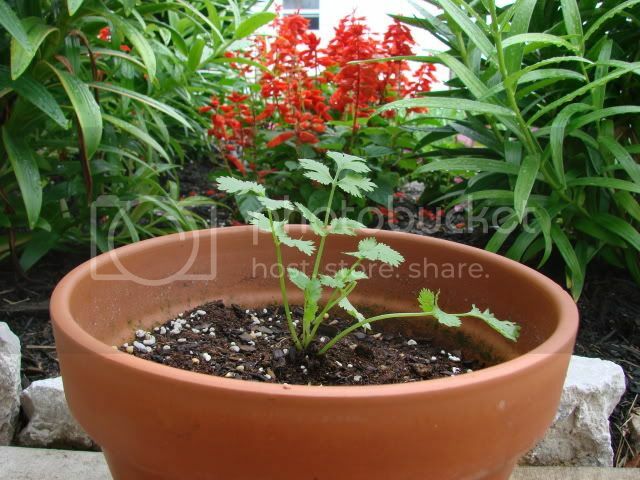 I plant both parsley and cilantro in containers, so they never get the size that the plants are supposed to achieve when planted in the ground. But three clusters spaced equally in a one foot deep and 12 inch by 24 inch container do give us a very good harvest. Parsley is easy to overwinter, so right now last year's plants continue to give a steady stream of sprigs. The succession plants have already been started, though germination was very poor and will have to reseed some more plants. Cilantro is fairly tender and does not over winter well. Those seeds are up and growing. I, like you, tend to have mixed results with cilantro. Some plantings grow really well and others struggle. I think that planting them in 100% potting soil has been a problem in the past, as the soil stayed too wet. This year's the mix has been blended with about 20% perlite to give better drainage. If you ever decide to plant parsley from seed, you may want to google it. The seeds do not like to germinate and can be a challenge, but there is plenty of advice on how to get better results. My main strategy for these two herbs consists of a series of succession plantings, so that at least one or two containers always has young vigorous plants. hendi_alex wrote: I think that both parsley and cilantro are biennials. So lots of times if the transplant has been exposed to cold weather or low winter light conditions, whichever is the trigger, it thinks that it is two years old when rapid growth starts in spring/early summer. So that could be one issue, as the plant starts putting most of its energy into flower and seed production. Thanks for your input. I will put your thoughts into use. Here is a photo of one container that was overwintered. Recently pulled the plants and replaced the soil. The plants are already showing signs of bloom and will probably just provide limited harvest from here on. However, they will provide for the transition, until the fresh plants get large enough to begin providing leaves. At any given time we have at least two of these containers with mature plants providing an adequate supply of leaves. I find that cilantro reseeds itself so readily that I rarely have to plant it anymore, but it does bolt easily in warmer weather. I'm in zone 7 and my cilantro does well til about june 1. Parlsey takes forever to germinate but once it does i find it over winters fine. I like to soak it overnight in warm water before planting it. Okay, I'm growing a cilantro plant that I purchased already semi-grown (whatever the correct term for that is) in a pot on my patio. It was droopy at first but now it's huge! it has two main "stalks" that have skyrocketed to 2.5 feet tall and "branches" and leaves get thinner and smaller towards the top. It's not super full, but it started growing these little flower-like things at the ends of the "branches" which I was told were supposed to be picked off. If I'm doing this right, I have no idea. I don't know when or how I should harvest the leaves But, I've been waiting to make some salsa! any input greatly appreciated! IMO you really need to keep a succession of plantings going if you are going to get good cilantro production. Sometimes if the conditions are just right, or for whatever reason, cilantro forms a wonderfully full, large plant. But more often, especially from plants started in the very early spring, the plant starts flowering, and most energy goes to that effort with very little leaf production. With a succession of seeds planted, there is a much greater chance that one or more batches will give vigorous leaf production on plants that last for several months. Thanks so much! I started some plants from seed and planted them around my exsisting cilantro plant about a month ago. They have not grown an inch since I transplanted them. I also sewed some seed in along with them and have not seen a sign of those. This past week here (Northwest Alabama, Florence) has been so hot. I've kept them watered well, but the herb bed is in the front of my garden and gets full sun ALL DAY LONG! Maybe I should try growing from seed and keeping in a pot close to my house in the shade. Um, what does "bolt" mean? I bought some flat leaf italian parsley and cilantro already growing and didn't cut from it for several weeks. During that time, it went crazy. I harvested some a few days ago for salsa (cilantro) and a pasta dish (parsley). I had always heard that those two plants will grow the more you cut them. In my past experience, I always got new growth in the areas where I cut them. The parsley seems to be doing fine, with new growth popping up. The cilantro seems to be stunted where I cut it. Part of my frustration with my cilantro plant is with it's tendency to curl over on itself and tangle, and that seems to cause the new growth coming from the bottom to not get enough sun and or air, so it never grows completely, rather, turns dark and slimy as the parts I haven't cut get taller and taller and taller. It seems like maybe if I cut the whole thing back a little, it would get better sun and circulation, but now I'm afraid to because I cut some several days ago and I'm not seeing much new growth yet. Did I cut it incorrectly? Should I cut from the top instead of the bottom? It is growing so fast on top of the remaining part of the plant it is like it's never mature, so I cut from the bottom, the oldest growth. Any idea what I'm doing wrong? It has been extremely hot here (90-97 from 9 or 10 am to 7 or 8 pm) for the last 3 weeks, and we've gotten no rain, though the humidity level is still high because of all the water in the area. I still water it every day, and it is in a pot that has a reserve thingy on the bottom for excess to be stored. When I feel the soil in the evening, it feels moist but not wet. Oh, and the main stems have thickened and turned woody with no new green areas coming up. My basil is doing that too, but since I just pull individual leaves off the basil, it's not a big deal. (The parsley is growing more like grass would.) Is that supposed to happen? I've never gotten this far with cilantro before, because the drought doomed it last year. ShannonC wrote: Thanks so much! I started some plants from seed and planted them around my exsisting cilantro plant about a month ago. They have not grown an inch since I transplanted them. I also sewed some seed in along with them and have not seen a sign of those. This past week here (Northwest Alabama, Florence) has been so hot. I've kept them watered well, but the herb bed is in the front of my garden and gets full sun ALL DAY LONG! Maybe I should try growing from seed and keeping in a pot close to my house in the shade. I started some from seed myself. I thought for sure it was a lost effort not sure but it took a month or so before anything popped out, with regular watering just in case. That would be in a container in partial shade on my front porch. Not real big, hell not even sorta big but it's all I have for now. It seems that cilantro is hard to grow, well, at least for me. I don't know how many seeds I put all over my yard in various gardens only to come up with very little to nothing.